Info "Give your friend a hand!" Cliff-Hanger is one of Dr. Crygor's microgames in WarioWare: Twisted! The name of this microgame is a play on the cinema term. The goal of this microgame is to save the man hanging from a cliff, which is done by tilting the Game Boy Advance to help him reach the rescuer's hand. If done so before time runs out, the game is won. If the man falls off or time runs out before he climbs up to safety, the player loses. 1st level difficulty: Move the man close to rescuer's hand. 2nd level difficulty: Move the man closer to rescuer's hand. 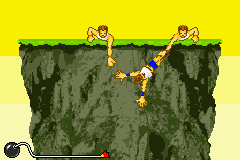 3rd level difficulty: Move the two men a bit closer to rescuer's hand.